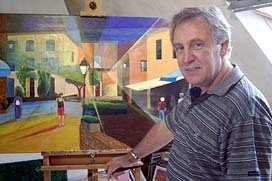 Guy Stoeffler is an artist who may be defined as a “dabbler”, as he is really fond of discoveries. When presenting his last paintings, work of a whole year, he is already in another style. What an imperceptible and diverting boy! The galleries showing his painting would like him to stabilize in a style, having a unity in his painting. He won’t do it. He’s making up for what he considers to be lost time. He’s a compulsive pictorial discoverer. He was only able in 1995 to create on a canvas. Then he retired from artistic field to dedicate himself to his professional career. He is fascinated by painting and often attends auction rooms, galleries and exhibitions. It's besides by leaving one of those that he tried to paint for the first time, with his daughter’s watercolors. Twenty watercolor paintings later, this impulsive man felt restrained by this technique. He discovered oil painting and would not leave it, except for some acrylic tries. To define his style: impossible! I already told you, he’s imperceptible. Nevertheless, his Mediterranean and Franche-Comté landscapes are always bathed by the sun. When he paints autumn, it’s for its color abundance. His still lifes seems so living that we'd like to gather their flowers. Here comes a surrealist period. One same theme illustrates five or six paintings. He goes through abstraction with a minimalist style and he discovers de Staël. Where does he bring us? And are we able to follow? Absolutely, if we like to travel with him through his colorist dreams and his painting creations. About painting, he has also presided for three years the "Toiles et Couleurs" (Canvas and Colors) association, he organized the "Ateliers Ouverts""Ateliers Ouverts" (Open Studios) local exhibition, which was very successful from its first time (3000 visitors) thus placing him at the head of this kind of exhibitions. .